There are certainly a couple very obvious benefits of UV rays. The sun’s rays provide both warmth and light that contribute to people’s overall well-being and also stimulate the blood circulation in the body. There are some UV rays that serve to increase the production of vitamin D in the body as well. Vitamin D is essential to the body’s skeletal development, to our immune system and function and to the formation of blood cells in the body, so some moderate exposure to UV rays is acceptable. This little bit of sunlight each day can certainly be beneficial to people. However, recognizing the levels of acceptable UV exposure in order to embrace the benefits it affords is critically important. Exposing your body to 10 or 15 minutes of casual sun for approximately three times per week during the hot summer months is an adequate amount of exposure to assist with appropriate levels of vitamin D. Any more than these acceptable levels can and will be harmful to your skin and to your body as a whole. In addition, exposure to regular sunlight has been proven to naturally increase levels of serotonin in the human body. This increase in serotonin makes people more active and more attentive. The National Institutes of Health published an article that said that using exposure to bright light actually increases serotonin without having to take any drugs. A study was performed which revealed a positive connection between an increased development of serotonin and the hours exposed to regular sunlight during the daytime hours. In this study, the researchers found that the increase of serotonin in the brain of the male volunteers was much lower during the winter, while the production of serotonin was much higher when the volunteers were in the sunlight for longer periods of time. When your skin is exposed to UV rays it releases a chemical compound known as nitric oxide. Nitric oxide actually lowers blood pressure. Studies performed by dermatologists with individuals under UV and heat lamps revealed that when the individuals were exposed to both of the light sources a significant lowering of blood pressure was noted after an hour of exposure. However, when the UV rays were blocked and only the heat affected their bodies, there was no change in blood pressure. In each of the studies performed vitamin D levels in all the individuals, in both cases, were completely unaffected. Further benefits to UV rays are the simple fact that they are often used successfully to treat a wide range of diseases, including jaundice, rickets, eczema and psoriasis just to name a few. However, it is important to recognize that these UV radiation treatments are rendered to patients under extreme medical supervision, which ensures that the benefits of the radiation treatments will always outweigh the risks that can potentially be presented. 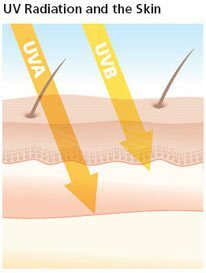 Overall, it is important for people to recognize and understand that UV rays are primarily dangerous to the human body. Though there are some exceptions where the UV rays are actually beneficial, the dangers of UV rays to the skin and to the body, in the long run, far outweigh the few benefits that exist.